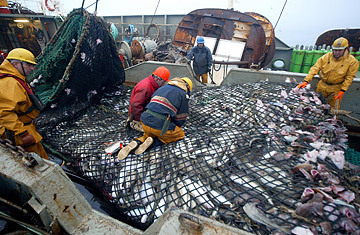 Fishermen aboard the French trawler Grande Hermine, a cod-fishing boat, in the Barents Sea. Far out on the high seas, on any given day, hundreds of fishing vessels drag huge nets, big enough to snag a 747 jumbo jet, across the ocean bottom, vacuuming up 150-year-old fish, flattening ancient reefs and destroying everything else in their paths. Only the biodiversity of tropical rainforests rivals that of the deep sea  our planet's largest wilderness  an aquatic wonderland that is now being systematically razed by what is likely the world's most environmentally destructive business. The fishing occurs mostly around the ocean's most unique topographical formations  submarine canyons, mid-oceanic ridges and tens of thousands of seamounts (most are extinct volcanoes)  which support a stunning profusion of endemic species, many of which are yet to be discovered. Trawlers reduce these habitats to rubble in minutes, undermining the viability of the very fish that brought the vessels there in the first place. A "rapidly growing number of scientific studies documenting [deep-sea] trawling impacts led to the unmistakable conclusion that bottom trawling is the world's most harmful method of fishing," says the Deep Sea Conservation Coalition, which comprises leading environmental NGOs around the world and advocates an immediate moratorium on the practice. But the problem is worsening, say experts, because more and more fishing vessels are heading out to the high seas  traditionally, a fishing free-for-all  to "top up" their load once they've hit the quota for their home country's fishing area, known as an exclusive economic zone. At the same time, demand keeps rising in wealthy countries for nutritious, and delicious, white-fish meat from species that have become increasingly hard to find closer to shore. "All fisheries are turning gradually into deep-sea fisheries because they have fished themselves out of the shallow waters," says Robert Steneck, a marine ecologist at the University of Maine. "The solution is not going into the deep sea, but better managing the shallow waters, where fish live fast and die young but where the ecosystems have greater potential for resilience." High-seas bottom fish are also far more fragile than their shallow-water cousins. They are slow-growing, long-lived species  the orange roughy, for instance, can live 150 years  which perversely encourages fishermen to take as much as they can, while supplies last. Some 20 years after New Zealand started its orange roughy industry in the 1970s (the name orange roughy was dreamed up to better market the slimehead fish, which was initially tossed overboard as trash fish), the ocean's stock of roughy was 75% depleted. Over the years, this "tragedy of the global commons" has resulted in the serial depletion of one species after another. "Industrial fisheries are now going thousands of miles, thousands of feet deep and catching things that live hundreds of years in the least protected place on Earth. They are roving bandits using state of the art technologies to plunder," says Elliott Norse, president of Marine Conservation Biology Institute. This is a business that couldn't stay afloat without substantial subsidies from governments of roughly a dozen high-seas fishing nations  including Japan, South Korea, Russia, Iceland, Spain, France and the Ukraine  according to new research conducted by the University of British Columbia's Fisheries Centre. The subsidies defray substantial fuel costs  trawlers need a lot of power to move nets that weigh 15 tons and stretch a mile deep  keeping these boats working around the clock for weeks and months, mining the deep sea (it takes about four hours to fish 2.5 sq km). The good news is that, although the practice is growing, high-seas bottom-trawling is still a relatively small portion of the global fishing industry. Among the 12 leading high-seas fishing countries, bottom-trawling accounted for less than 2% of the 15.5 million tons of total landed catch, and added about $600 million to a worldwide $26 billion-a-year fishing business. And University of British Columbia researchers calculate that current subsidies for high-sea bottom-trawling amount to just over $150 million, a small fraction of the $30 billion that governments spend yearly to prop up a global fishing industry that produces twice as much as is sustainable. "It's important to nip these subsidies in the bud before more interests get barnacled around them," says University of British Columbia's Rashid Sumaila, who has advised the World Trade Organization on the issue. "Eliminating them would render these fleets economically unviable and would relieve tremendous pressure on over-fishing and vulnerable deep-sea ecosystems." After three years of negotiations among roughly 40 countries, the United Nations General Assembly agreed in December 2006 to a new regulatory regime for high-seas fisheries  but Japan, Russia, Iceland and Canada objected to a complete moratorium on unregulated bottom trawling. If enforced, the U.N.'s compromise resolution would require fishing nations to conduct environmental impact assessments demonstrating that their fishing is not harmful  that could spell the end of deep-sea bottom trawling, which accounts for 80% of all deep-sea catches. But it's a fate that some countries are willing to face. New Zealand's fishing industry  long a poster child for everything that was wrong with the business  seems to have accepted the new terms after an intense public debate. Still, there is considerable uncertainty over whether other countries will abide by the new norms. Spain, among other countries, has a history of using loopholes to get around quotas and conservation-monitoring laws. And Russia, which got the world started on bottom-trawling in the 1960s, is now reviving its deep-sea capacity, say concerned conservationists. "For the last several hundred years  since [Hugo] Grotius wrote his 'Freedom of the Seas' treatise [in 1609] we have had freedom to fish on the high seas, without constraints, but clearly for deep-sea bottom trawling this can't continue. And I am reasonably optimistic it can be stopped," says Matthew Gianni, Deep Sea Coalition co-founder, who became a conservation advocate 20 years ago, after a decade of trawl fishing off U.S. coasts. "If there is going to be a turning point I think the concerns and the process of negotiation that played out at the General Assembly will prove to be that point."